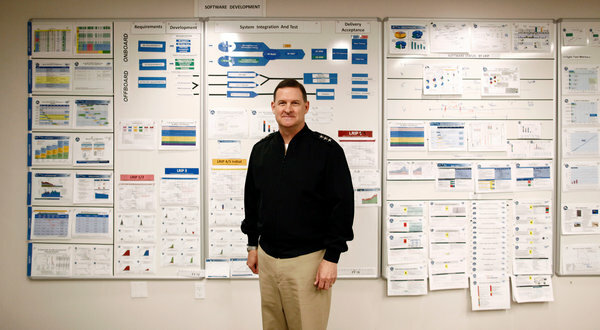 Does this look like the dashboard for a 3-star running a zillion-billion dollar defense program? 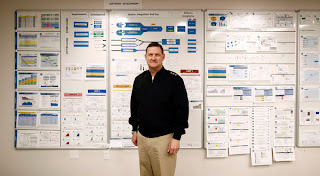 That's Vice Admiral David Venlet in the photo, and that dashboard is the way he likes it: low tech, but informative. Unfortunately for the Admiral-program manager, good and useful and timely program information does not necessarily beget good and timely program performance. This dashboard is for the F-35 fighter aircraft, and by all accounts this program is in big doo-doo. Of course, that's what you'd learn by examining the data; so there's no mystery that the earned value for this project is way off the mark. But, back to the dashboard. You can see from the panel on the left that there are many charts to show trend lines for measurements for several different metrics. Project flows are in the center panel, and then subsequent panels on the right document other project activities. One unique aspect of this dashboard is that some of the data is for the design and development program for the aircraft, and some are for the production program. The acquistion strategy for the F-35 was to begin production as soon as there were design models that verified the likely performance. Simply put, that's a risky strategy, and if the assumptions break down, as they did in this program, all the dashboards in the war room can't put humpty dumpty back on the original track. One metric that is on this dashboard is the sunk cost -- the actual cost to date. Some are saying that the program must go forward so that the sunk cost is not a waste. Others say you shouldn't make a decision on the basis of sunk cost -- only the future is relevant. So far, it's been decided that the future is relevant and the program continues.